Creating a perfect watermark for a photo is time consuming. You have to set appropriate font, font size, the optimal transparency level and positioning. Creating the same kind of watermark every time is a waste of time and you can't be sure the watermark will be the same as the last one. 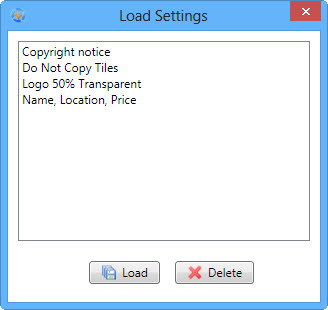 uMark allows you to save the watermark settings for later use. 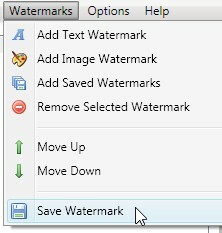 Once you have created your perfect watermark save if by clicking on the save watermark button or by selecting the Watermark > Save Watermark menu option. When you save a watermark you will be asked to give it a name and it will be saved with that name. 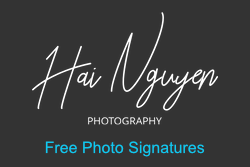 Next time when you want to apply the same watermark on another set of photos, just select Add Saved Watermark option and you will be shown a list of all your saved watermarks. You can select any previously saved watermark and that watermark will be applied to your selected photos. You can get going right away! You can save as many watermarks as you want so you can create various types of watermarks for various occasions or for various types of photos. Like you can have one type of watermark for photos that you post on your blog, and you can have another that you post share on Facebook or other social sites. You can have a watermark for your business and another one in your personal name. Large watermarks for some types of photos and small more subtle watermarks for different kind of photos. Create your watermark once and watermark your photos in seconds every time without having to start from scratch.